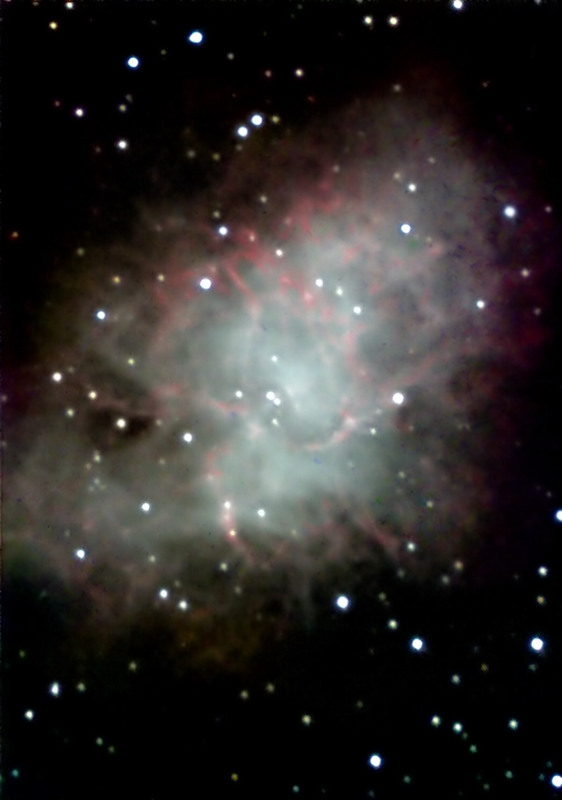 M1, the Crab Nebula in Taurus, remnant of the supernova seen in 1054 A.D., full-color (L 7 x 300s, R 600s, G 600s, B 2 x 600s) AO-7/ST-7XE image at f/6.3 by F. Ringwald, processed by Aaron Hathaway. 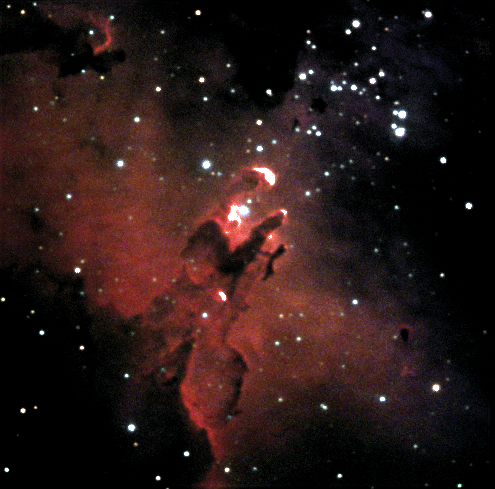 M16, the Eagle Nebula in Serpens, full-color (L made from Schuler H alpha 61 x 30s, R 25 x 30s, G 25 x 30s, B 41 x 30s, all through a Hutech IDAS light-pollution filter) ST-9E image at f/6.3 by F. Ringwald, processed by Steve Rodriguez. 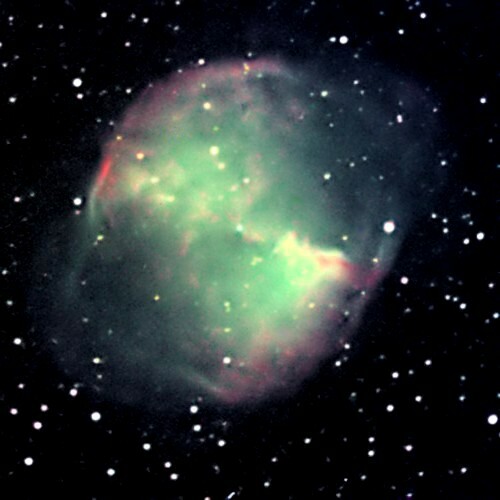 M27, the Dumbbell Nebula, planetary nebula in Vulpecula, full-color (L 8 x 60 s through an Orion Skyglow filter, R 10 x 30s, G 14 x 30s, B 22 x 30s, all through a Hutech IDAS filter) ST-8 image at f/6.3 binned 2x2, by F. Ringwald, Aaron Hathaway, Takako Kurimoto, Sarah Lin, Blaine Parks, and Shawn Walters. 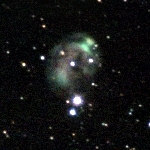 full-color (R 5 min, G 5 min, B 2 x 5 min) AO-7/ST-7XE image at f/10 by F. Ringwald and G. Morgan. 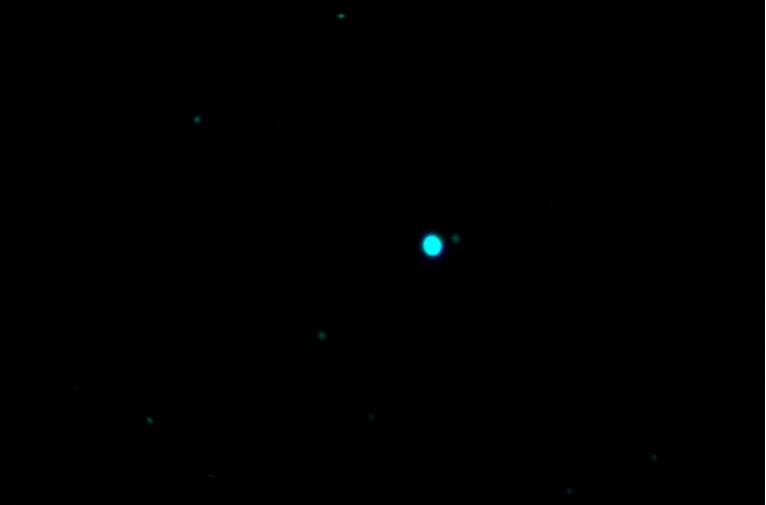 Click here for an animation of Jupiter over 4.2 hours (466 kbytes) (ST-10XME, no filter, f/38), 2003 March 25 (AVI file for Windows Media Player), by Greg Morgan. A full descrption is here: Io transits Jupiter, its shadow follows, then Europa emerges from left. 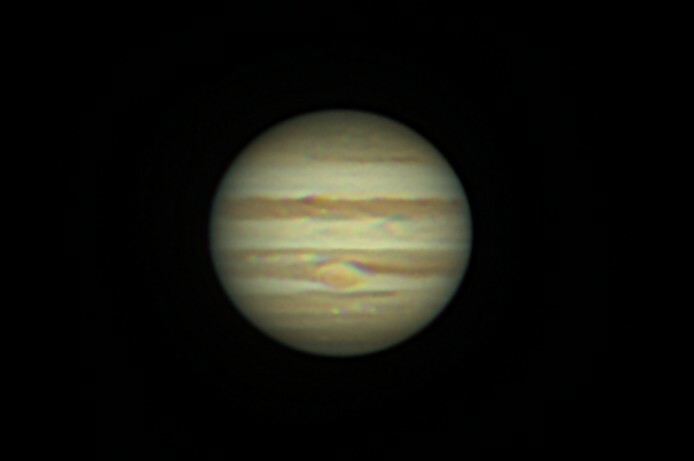 Click here for the Jupiter Gallery. 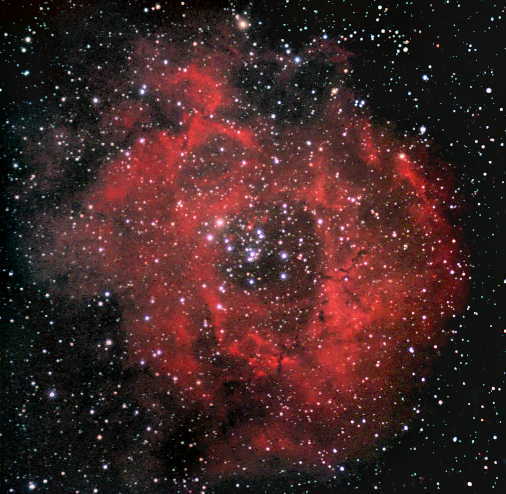 full-color (L 5 x 600s, R 600s, G 600s, B 2 x 960s) AO-7/ST-7XE image at f/6.3 by F. Ringwald, processed by Aaron Hathaway. 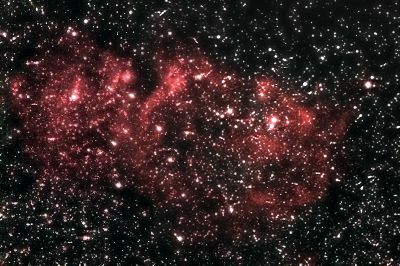 Click here for the Galaxy Gallery. 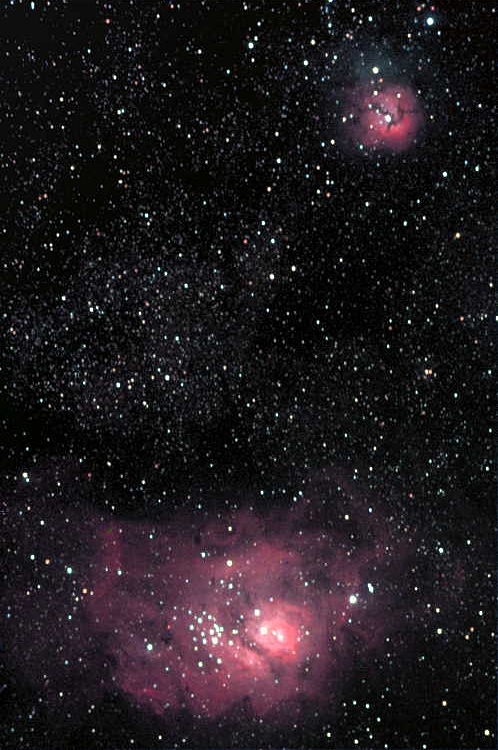 M20, the Trifid Nebula (top) and M8, the Lagoon Nebula (bottom), full-color (L 9 x 180s through an Orion Skyglow filter, R 9 x 180s, G 9 x 180s, B 13 x 180s, all through a Hutech IDAS light-polllution filter) ST-8 exposures through the 70-mm guidescope at f/5.7 and unsharp-masked by F. Ringwald, processed by Michelle Meyers. Click here for the Moon Gallery. Click here for the Eclipse Gallery. 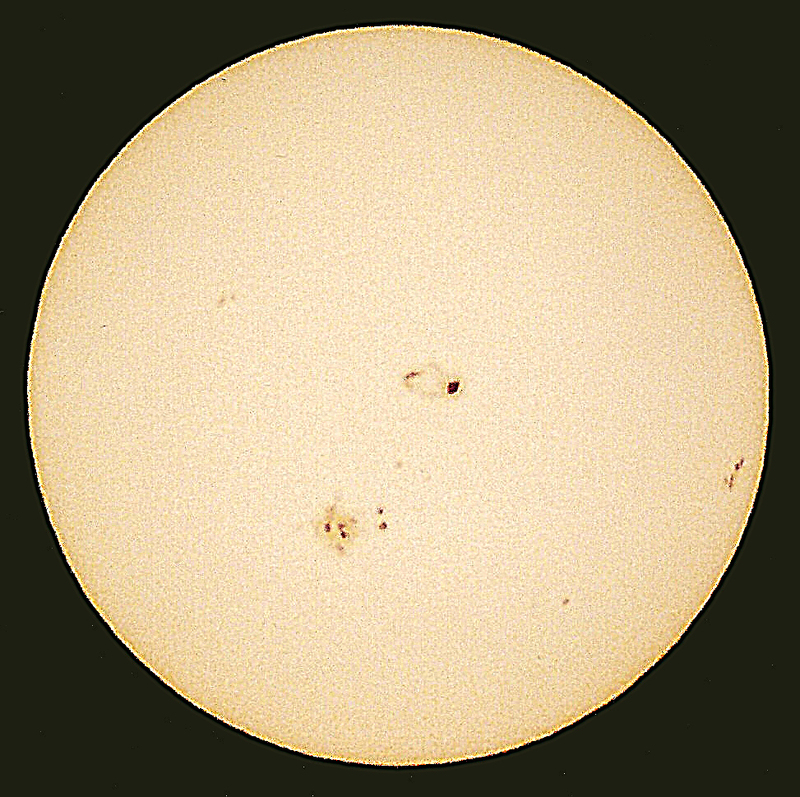 The Sun in H alpha light, 2005 April 16, full-color Registax stack of 71 (out of 321) x 1/30-s unfiltered Philips ToUcam exposures through a Coronado Helios 1 (70mm, f/5.7, 0.8nm bandpass) solar telescope by F. Ringwald. Click here for the Solar Gallery. 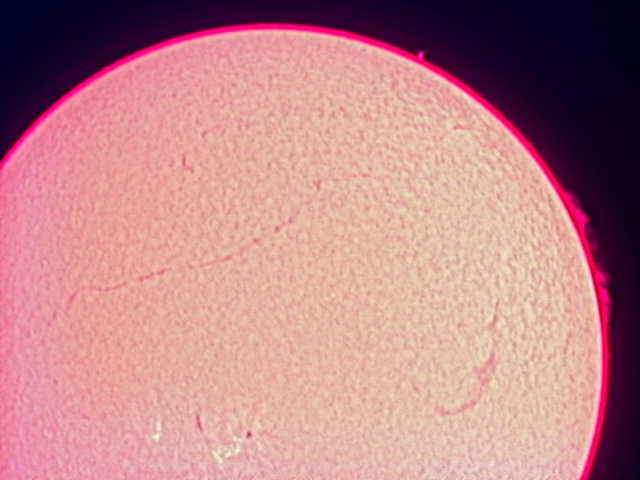 The Sun in white light, 1/8-s exposure on 200-speed Kodak Gold 35-mm film, through an Orion 90mm refractor and an Orion full-aperture glass solar filter at f/10 by F. Ringwald. 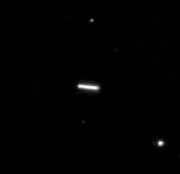 Mercury, near Greatest Western Elongation, 2003 September 27, average of 100 x 0.11-s ST-7XE exposures at f/20 (with a 2x Barlow lens) by F. Ringwald, processed with unsharp masking and local adaptative sharpening by Aaron Hathaway. 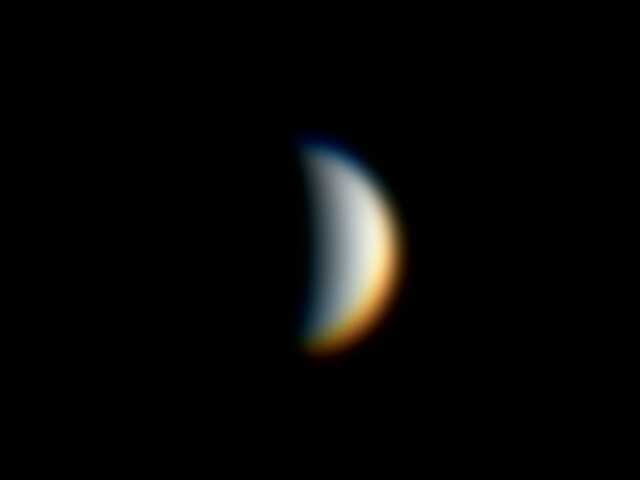 Venus, 2005 November 18, full-color Registax stack of 40 (out of 548) x 1/30-s unfiltered Philips ToUcam exposures at f/20 (with a 2x Barlow lens) by F. Ringwald, processed by Jose Ortiz. 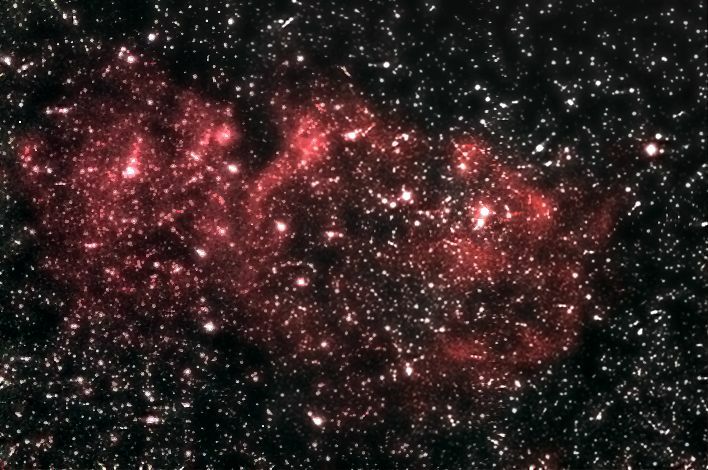 The colors are from dispersion in Earth's atmosphere. 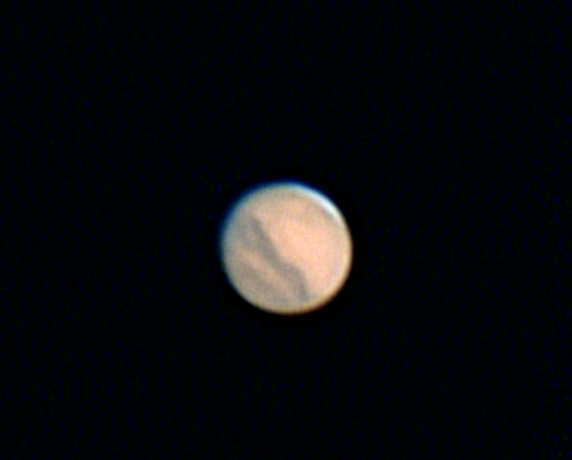 Mars, 2005 November 17, full-color sharpened Registax stack of 1/30s Philips ToUcam exposures at f/20 by Ashton Ellis. 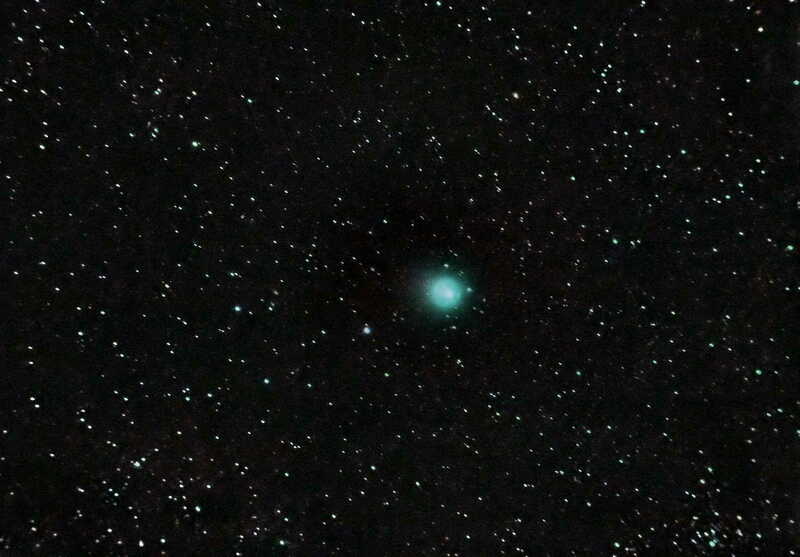 Click here for the Mars Gallery. 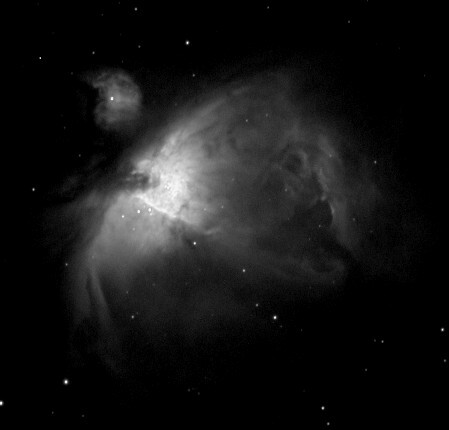 2003 February 23 at 6:13 UT, full-color (255 images taken in 30 min, 42 used: R 10 x 0.33s, G 14 x 0.33s, B 18 x 0.33s) ST-10XME eyepiece projection at f/38 (click here for a short animation with no filter) (AVI file for Windows Media Player), by Greg Morgan. 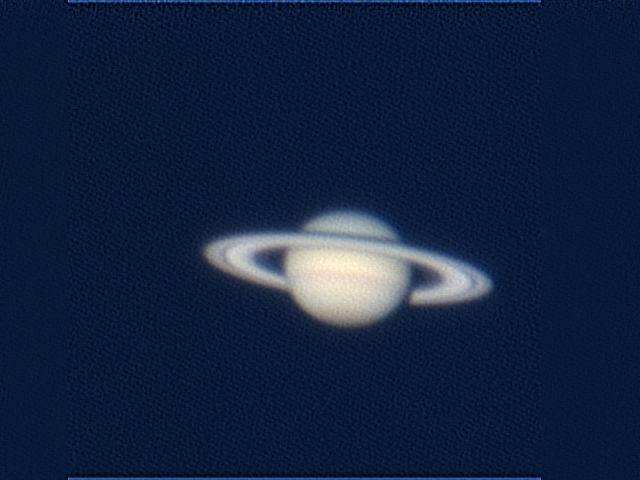 Saturn, 2006 December 4, full-color sharpened Registax stack of Philips ToUcam exposures at f/20 (with a 2x Barlow lens) by Jeraldo Martinez. Click here for the Saturn Gallery. 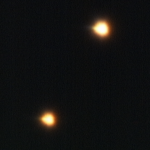 Uranus and its moons (from top to bottom: Umbriel, Miranda, Oberon, Ariel, Titania), 2003 October 12, full-color (L 36 x 1.0s, R 16 x 3.0s, G 16 x 3.0s, B 16 x 5.0s) ST-7XE image at f/10 by Matthew Garrett. Neptune and its moon Triton, 2003 October 12, full-color (L 5 x 1.0s, R 5 x 3.0s, G 5 x 3.0s, B 5 x 5.0s) ST-7XE image at f/10 by Matthew Garrett. 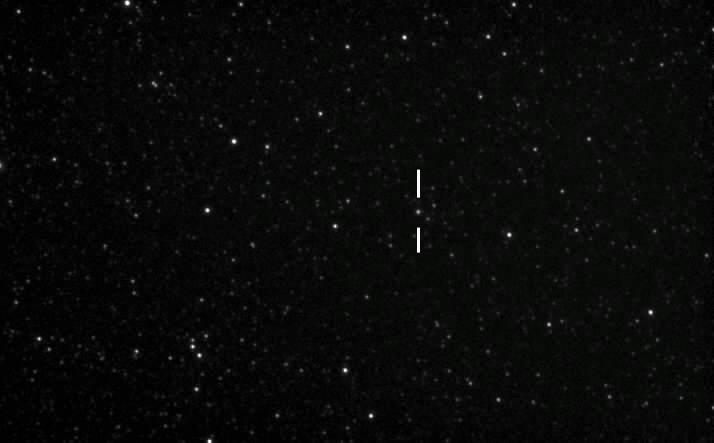 Pluto at V = 13.8, 2004 May 13, 9 x 300-s ST-7XE exposures through the 70-mm guidescope at f/5.7 with a Hutech IDAS light-pollution filter by F. Ringwald. 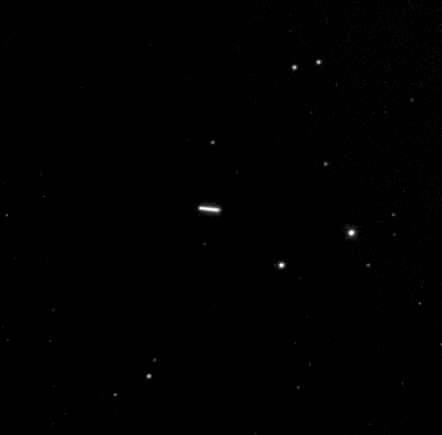 Asteroid 4 Vesta, 2006 April 17, 32 x 10-s ST-9XE exposures (with 60-s delays between each) at f/6.3 through a 9.0-nm Schuler H alpha filter by F. Ringwald. 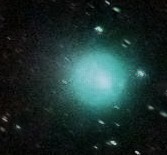 Comet Machholz (C/2004 Q2), 2005 January 30, a single 300-s exposure with a Canon-EOS 300D Digital Rebel AstroCamera (modified for astrophotography by Hutech) at ISO 1600 through the 70-mm guidescope at f/5.7 with a Hutech IDAS light-pollution filter by F. Ringwald. 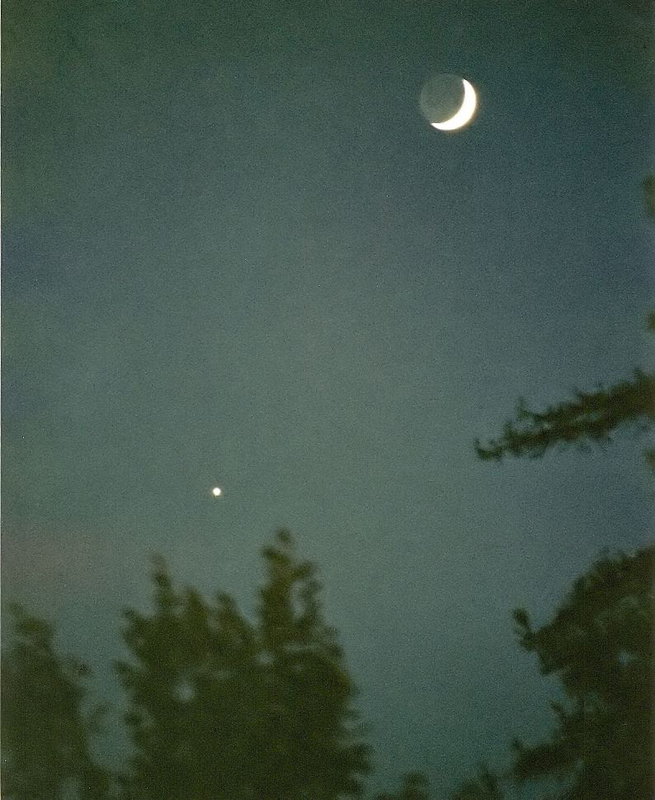 The Moon and Venus. 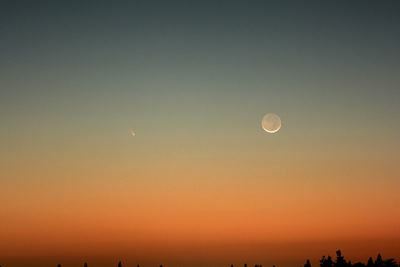 (The reflected Earthshine on the Moon is called the "Old Moon in the New Moon's Arms.") 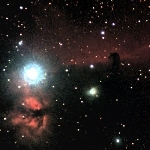 This is a 1/15-second exposure on 800-speed Fujicolor Superia X-Tra film, through a zoom telephoto lens with f = 135 mm at f/4 and post-processed with Neat Image, by F. Ringwald. 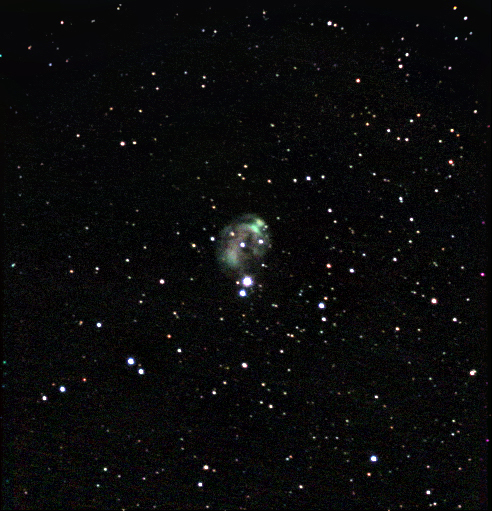 NGC 7008, planetary nebula in the constellation Cygnus (the Swan), full-color (L 11 x 20s, R 5 x 20s, G 5 x 20s, B 9 x 20s, all through a Hutech IDAS light-pollution filter) ST-9XE exposures at f/6.3 by F. Ringwald, processed by Steve Rodriguez. 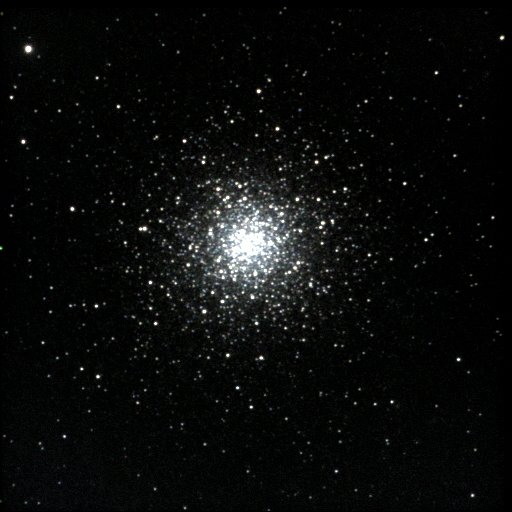 M3, globular cluster in the constellation Canes Venatici (the Hunting Dogs), full-color (L 11 x 20s, R 5 x 20s, G 5 x 20s, B 9 x 20s, all through a Hutech IDAS light-pollution filter) ST-9XE exposures at f/6.3 by F. Ringwald, processed by Steve Rodriguez. 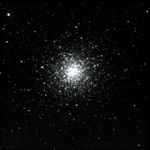 Click here for the Globular Cluster Gallery. 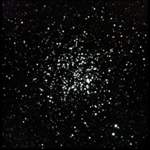 M11, "the Wild Ducks" (open cluster in Scutum), full-color (L 11 x 20s, R 5 x 20s, G 5 x 20s, B 9 x 20s, all through a Hutech IDAS light-pollution filter) ST-9XE image at f/6.3 by Ben Zastnovik. 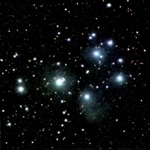 Click here for the Open Cluster Gallery. 61 Cygni, nearby double star system, full-color ToUcam image at f/20 (with a 2x Barlow lens) by F. Ringwald. 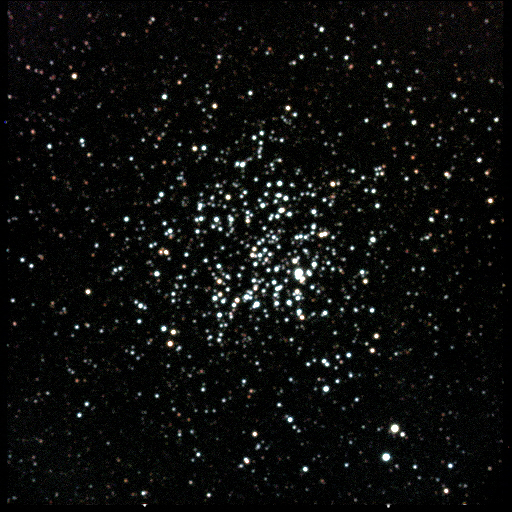 Bright and Multiple Stars Gallery. M45, the Pleiades, open cluster in Taurus, full-color (L 79 x 180s, R 15 x 180s, G 15 x 180s, B 15 x 300s, all through a Hutech IDAS light-pollution filter) ST-9XE image through the 70-mm guidescope at f/5.7 by F. Ringwald. 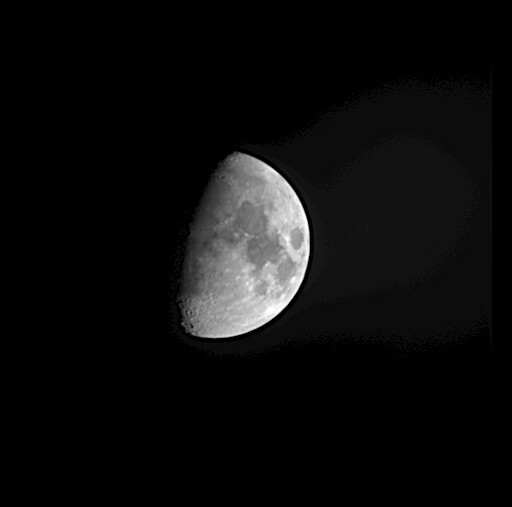 Wide-field image of the Moon, median of 25 x 0.1-second ST-9XE exposures through the 70-mm guidescope at f/5.7 through a 9.0-nm Schuler H alpha filter and unsharp-masked by F. Ringwald. 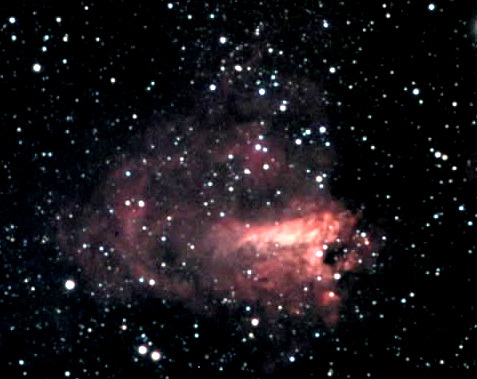 M17, the Swan Nebula, full-color (L 9 x 180s through an Orion Skyglow filter, R 9 x 180s, G 9 x 180s, B 13 x 180s, all through a Hutech IDAS light-pollution filter) ST-7XE exposures through the 70-mm guidescope at f/5.7 by F. Ringwald, processed by Michelle Meyers. 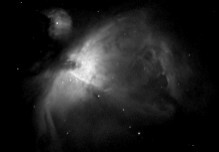 M42, the Great Nebula in Orion, 2 x 180s ST-8 exposures through the 70-mm guidescope at f/5.7 with a 4.5-nm Custom Scientific H alpha filter, processed by digital development, by F. Ringwald. 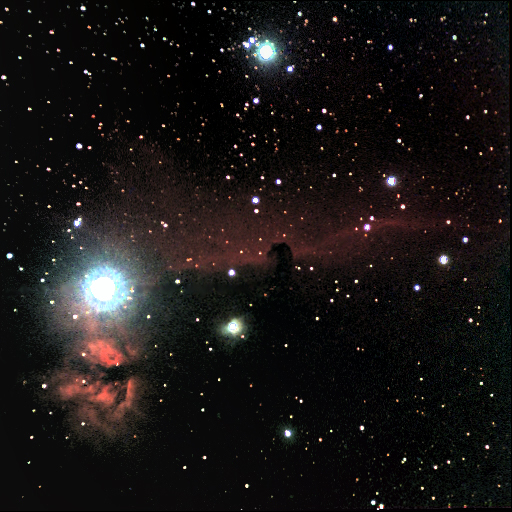 IC 434, the Horsehead Nebula (center), and NGC 2024, the Flame Nebula (bottom left, near the bright star Zeta Orionis, or Alnitak), full-color (L 11 x 180s, R 5 x 180s, G 5 x 180s, B 9 x 180s, all through a Hutech IDAS light-pollution filter) ST-9XE exposures through the 70-mm guidescope at f/5.7 by Jonathan Roveto and Kenia Velasco. 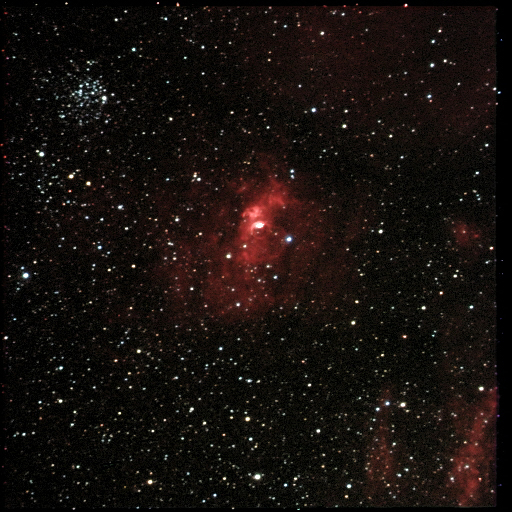 M52 (at top left) and NGC 7635, the Bubble Nebula, open cluster and nebulosity in Cassiopeia, full-color (L 79 x 180s, R 15 x 180s, G 15 x 180s, B 15 x 300s, all through a Hutech IDAS light-pollution filter) ST-9XE image through the 70-mm guidescope at f/5.7 by F. Ringwald, processed by David Baer. 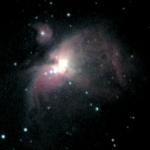 M42, the Great Nebula in Orion, full-color (L 79 x 180s, R 15 x 180s, G 15 x 180s, B 15 x 300s, all through a Hutech IDAS light-pollution filter) ST-9XE image through the 70-mm guidescope at f/5.7 by Jaime Vargas. 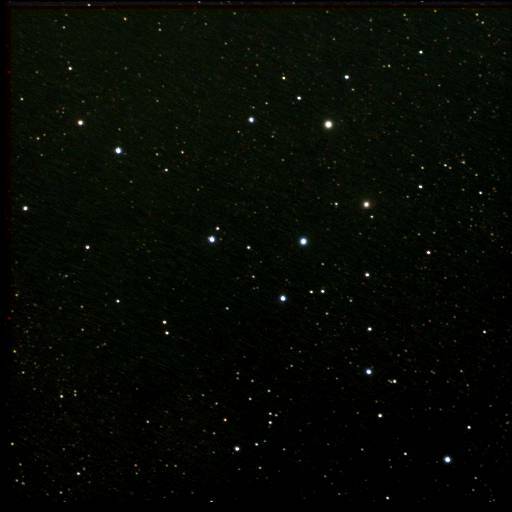 The Coathanger, also called Collinder 399, asterism in Vulpecula, full-color (L 27 x 120s, R 5 x 120s, G 5 x 120s, B 9 x 120s, all through a Hutech IDAS light-pollution filter) ST-9XE image through the 70-mm guidescope at f/5.7 by F. Ringwald, processed by Zachary Girazian. 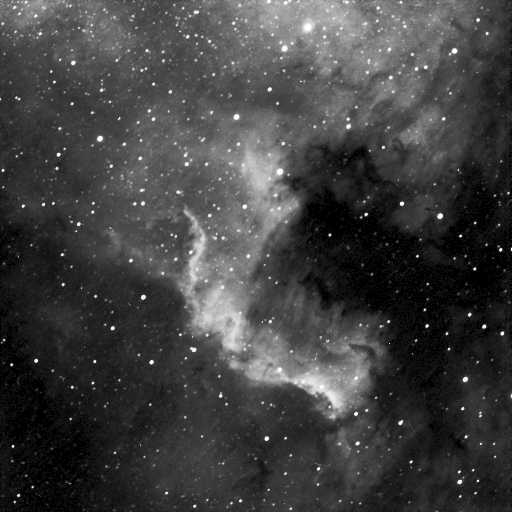 The Southern Half of the North America Nebula (NGC 7000) in Cygnus, median of 25 x 120-second ST-9XE exposures through the 70-mm guidescope at f/5.7 through a 9.0-nm Schuler H alpha filter by F. Ringwald, processed by Shawn Walters. 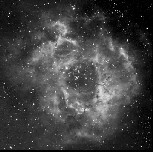 NGC 2237-9,46, the Rosette Nebula, surrounding open cluster NGC 2244 in Monoceros, full-color (L made from L 9 x 600s + Schuler H alpha 3 x 600s, R 3 x 600s, G 3 x 600s, B 5 x 600s) ST-9XE image through the 70-mm guidescope at f/5.7 by F. Ringwald. 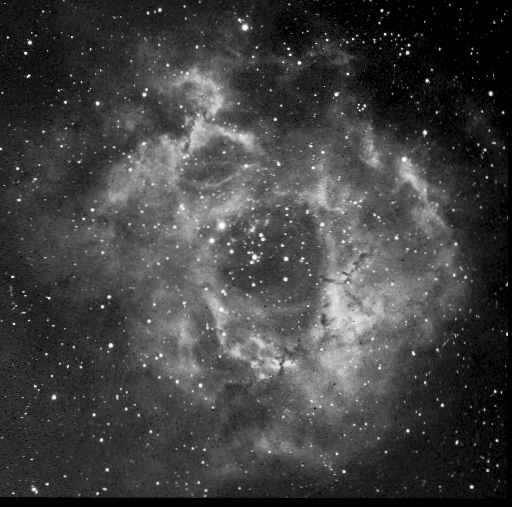 NGC 2237, the Rosette Nebula in Monoceros, median of 3 x 600-second ST-9XE exposures through the 70-mm guidescope at f/5.7 through a 9.0-nm Schuler H alpha filter by F. Ringwald. Comet Pan-STARRS and a 31-hour-old Moon, 2013 March 12 at 7:54 p.m, 50 minutes after sunset. 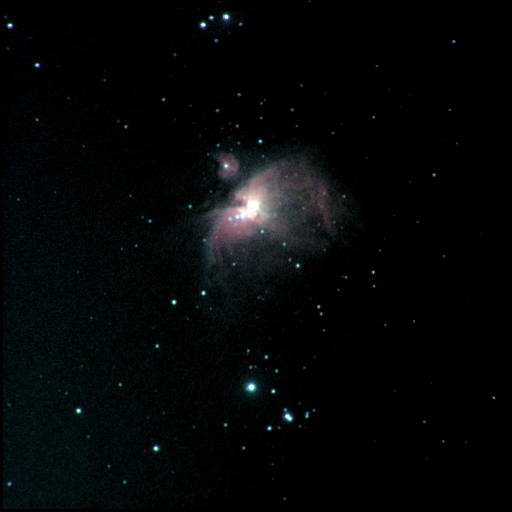 This is a 1.0-s exposure, taken with a Canon-EOS 60Da DSLR camera at ISO 1600 through a Canon EF 100-400mm f4.5-5.6L IS USM Telephoto Zoom lens at F=100mm and f/4.5 and processed with Neat Image by F. Ringwald. Jupiter and its moons, 2004 March 19 at 05:00 UT, full-color ST-7XE LRGB image at f/6.3 by Dan Chase and Scott Endler. 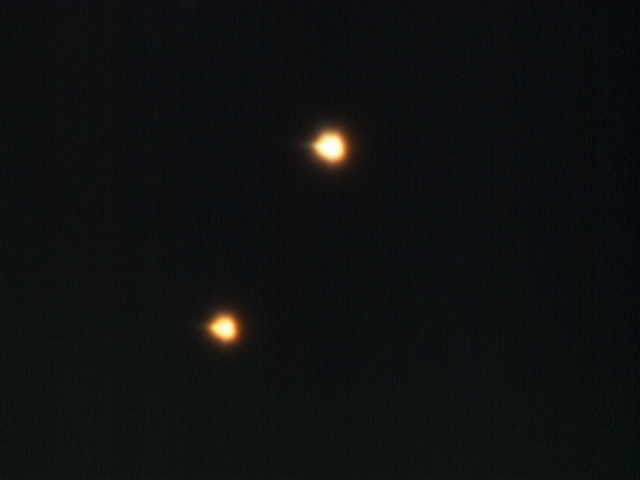 The moons reproduced as red and green spots, because of the way the color image was taken, one filter at a time. 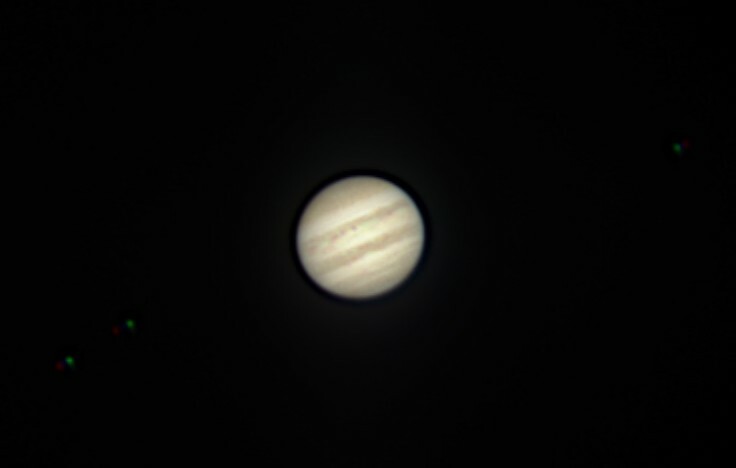 From west (left) to east (right), the moons are Io, Europa, and (on the east side of Jupiter) Callisto. 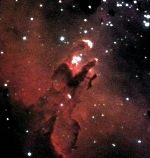 The Great Red Spot is just visible, on the western limb. IC 1848, the Soul Nebula in Cassiopeia, 2008 November 18, mosaic of two full-color ST-9XE images (L 24x60s, R 11x60s, G 10x60s, B 11x60s) through the 70-mm guidescope at f/5.7 and a Hutech IDAS light-polution filter by Randy Clark. 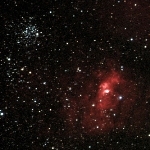 Edge-on galaxy NGC 4565, 49 x 30-s ST-8 exposures at f/6.3, by F. Ringwald. 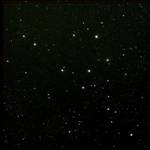 Click here for Bright and Multiple Stars Gallery. Click here for the Sierra Nevada Gallery. 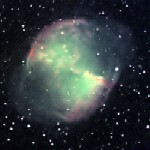 Click here for the Mount Laguna Gallery. Department of Physics, California State University, Fresno. Please read this disclaimer.